Coat of Arms: The coat of arms of Ghana is composed of a blue shield displaying a St. George's cross supported by two golden eagles. Centered within the shield is a golden lion symbolizing Ghana's close relationship to the United Kingdom, and the black star above the shield is a symbol for the freedom of Africa. 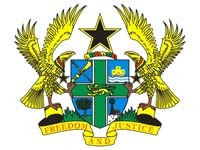 The national motto of Ghana is displayed on a ribbon below the shield.